Luis Suarez has not signed for Real Madrid. Last season’s Champions League winners wanted to sign the Liverpool man earlier in the summer, but have lost out to arch rivals Barcelona. According to ESPN FC, the Catalonia club paid 80 million euros to sign Suarez. See an AP report about the deal below. Barcelona reached agreement with Liverpool on the transfer of Luis Suarez on Friday, giving the troubled striker a chance to rehabilitate his image when his latest biting ban is over. Suarez will travel to Barcelona next week for a medical and to sign a five-year contract. “It is with a heavy heart that I leave Liverpool for a new life and new challenges in Spain,” Suarez said in a statement released by Liverpool. The Uruguay international is prevented from any involvement in football until the end of October after being handed a four-month suspension by FIFA for biting an Italian opponent at the World Cup in Brazil. His lost his appeal to FIFA on Thursday. But Barcelona had no qualms in bolstering its strike force with the footballing pariah, in the hope he can help the team regain the Spanish title. The 27-year-old Suarez can’t train with his new Barcelona teammates under the terms of his ban for biting Giorgio Chiellini in Uruguay’s group stage match against Italy. The World Cup moment of madness came at the end of a season that began with Suarez also being banned for biting, on Chelsea defender Branislav Ivanovic during an April 2013 English Premier League match. Barcelona will be hoping Suarez brings his goal-scoring form to the Camp Nou — he netted 31 in the Premier League last season — rather than the hot-headed temperament. Suarez’s transfer marks the second successive year that the man voted English football’s top player by his fellow professionals and journalists moved to Spain. Gareth Bale made an immediate impact after joining Real Madrid from Tottenham, making up for La Liga disappointment by winning the Champions League. Suarez’s transfer was a far smoother, less drawn-out saga compared with Bale’s move, and his own tactics last summer when Liverpool prevented its star from leaving Anfield. “We would like to thank Luis for his contribution and the role he played in helping bring Champions League football back to Anfield,” Liverpool said in a statement on its website. With Suarez already being banned for both racism and biting on Merseyside, Liverpool now avoids the need to take any disciplinary action against the player and can reinvest the transfer fee in the squad. 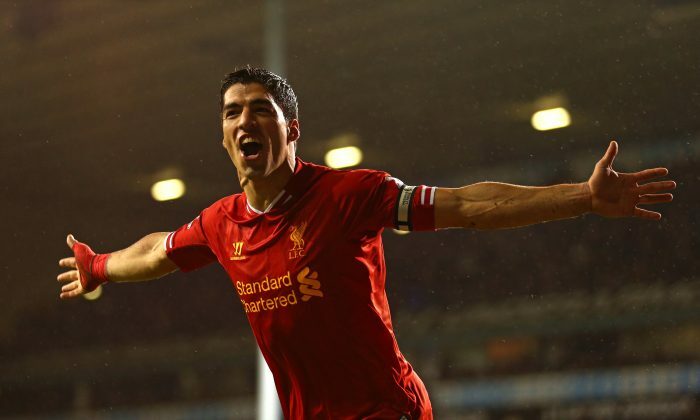 Just how reliant Liverpool was on Suarez will become quickly apparent. It was only with Suarez’s goals that Liverpool mounted an unexpected but ultimately unsuccessful challenge for the Premier League title last season.